Fresh mushrooms should be firm. 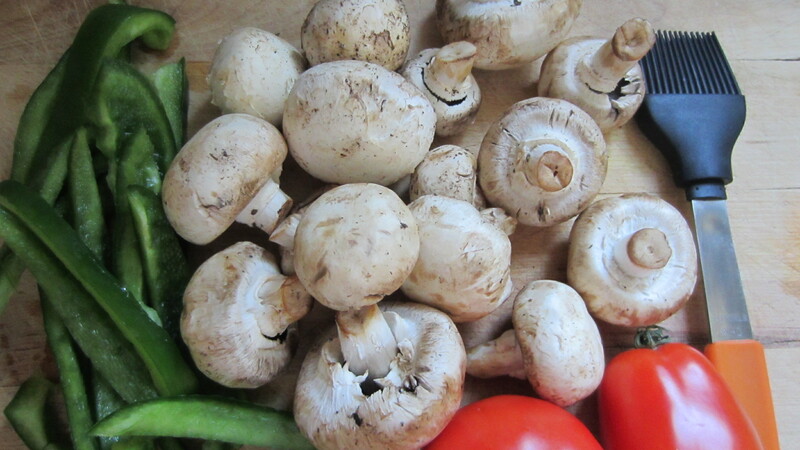 Avoid limp, wrinkled, or soggy mushrooms, and especially those with dried ends, which indicates that they are old. Tough ends, such as those of shiitake mushrooms, should be removed entirely. Clean all mushrooms by hand with a cloth or small brush (pastry brush, BBQ sauce brush, or even a paint brush), place in a paper bag and store in the fridge for up to 4-5 days. Mushrooms contain a great deal of water, so avoid washing them in a bowl of water, otherwise they will soak the water up like a sponge. Rather, let them warm up to room temperature before dicing and cooking them (this reduces the chances of you poaching them when you fry them in oil or butter, a common mistake). Only use water unless the recipe calls for it (such as with dried porcini mushrooms). When the oil begins to smoke, place the mushroom slices (1/8-1/4″ in width) into the hot pan, allowing them to sit for about 2 minutes. If you feel confident about your cooking (and cleaning) skills, shake the cooking mushrooms, and using your wrist, flip the mushrooms over. Stir or flip frequently for about 8-10 minutes. To extract the real mushroom flavor, they should fry, not poach (if you don’t like mushrooms, it may be that they’ve not been prepared properly). Once done, remove the mushrooms, or just take the pan off of the heat. In a pot, heat up the broth, and allow it to simmer on low. While the stock is heating, prepare the mushrooms as directed above. In a separate pan or pot large enough to hold the risotto, place about 2 Tbs of butter and heat. Place the onions in the hot butter and saute until the onion is translucent (about 5 minutes). Place the rice into the hot butter and onion mix. Stir well for about 3-4 minutes. Add the wine. Stir and cook the wine off (about 30 seconds). Now you shall begin the process of adding the broth, one ladle-full at a time, over the next 20-30 minutes. You must continue to stir every time you add the stock. After about 20 minutes, the rice will start to begin creamy. Now you are ready to add the sautéed mushrooms. Continue to stir. Taste the rice to see if it is ready. If it is soft, with a little resistance, then it is ready). If it is not, add a little more broth. Stir in the grated cheese. If the risotto seems too dry or difficult to stir, add some additional stock or milk. Sprinkle the parsley over the top, and serve with additional cheese. Knock your guests’ socks off by adding a drizzle of truffle oil over each individual serving. Be sure the oil has warmed up to room temperature. Pour the olive oil into a bowl large enough to hold the entire salad. Add the anchovies, and using the tongs of a fork, mash the anchovies into the oil. Now add the mashed garlic and ix the oil and garlic/anchovies together. Swirl in the mustard using your fork, and then add the Worcestershire sauce. Now using your hands, mix the romaine into the dressing covering all of the lettuce. Pour about 2 Tbs of lemon juice on the salad and mix. Finally, sprinkle the grated parmesan cheese and mix again. Serve immediately in salad bowls or plates, and sprinkle croutons on top. Now, we would be remiss if we didn’t share an equally delicious way of preparing and consuming this wonderfully aromatic vegetable with you – You must try C’est Le Vin’s take on Roasted Wild Mushrooms via the E.A.T. Blog.